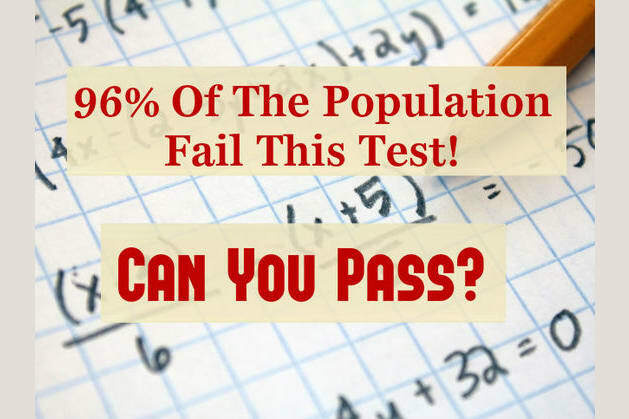 Only 4% Of The Population Can Pass This Math Test! 20 x 29 = ? 19 x 21 = ? 172 x 0.25 = ? 443 x 61 = ? 48.13 - 33.93 = ? 260% of 241 = ? 25% of 1,388 = ? 25 x 237 = ? 879 - 368 = ? 37 x 37 = ? 75% of 748 = ? 0.2% of 10 = ? 0.2% of 8 = ? You passed a math test only 4% of the population do. You think logically and symbolically, and you remarkably visualize numeric patterns. You reason analytically, and communicate mathematical concepts in creative and intuitive ways. Are we spot on? Let us know in a comment below. You didn’t pass the test. You’re probably just too imaginative for math. You have the ability to see different angles of every situation, as well as a need to be recognized and influential. Are we spot on? Let us know in a comment below. 20 questions to find out whether you are in the top 4%.